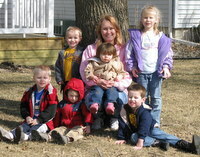 Child care jobs, are they right for you? In all my years, even in the worst of times, I have never been unemployed OR under-employed in this business! Are you a mom who wants to be at home with her kids, or a new mommy and you are absolutely dreading that you have to back to work after having your baby? (Heart breaking!). You obviously love kids and you have room in your heart for more... and maybe- just maybe- this could be the answer you've been looking for to being a stay-at-home mom. Just sick and tired of the rat race? The commute? The long hours of working for someone else? You hate your job? No job satisfaction... but you need a good, decent paying job? Want something where you are needed and shown love and care every day? 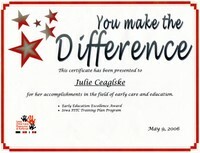 Maybe you are like one of my child care provider friends. She is not a mom (and that's alright, you don't have to be! ), but she absolutely adores kids. She was working in a child care center where she was pathetically underpaid and over-worked. She finally got tired of it and became a home provider so she could set her own hours, amount of children she cares for and pay rate... be her OWN boss. What a great idea, don't you think?!? Your kids could have playmates while learning to share with and care for others (they become like brothers and sisters). And in the mean time you are enjoying being with your kids, doing a "job" you love, PLUS earning an income that is pretty substantial! This is a stay at home job that you can grow over time. It has good pay with low overhead costs. There is a great opportunity to enjoy your child's formative years while making a full-time or part-time income. Parents who have to work need YOU to care for their children and there will always be working parents. That is excellent job security. Not sure what drives you- Or if you have the right qualities? Don't worry- I have a list of what qualities someone should have to become a successful and sought after provider on my Provider Qualities and Expectations page. You will find what parents are looking for. If you're not sure you've got what it takes, take a look. 30 years ago. I had so many unanswered questions about home child care jobs and business. 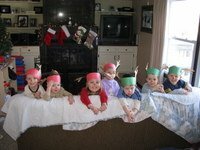 Can I handle an in home child care? What about the Parent Interview? I could write a thousand more questions here. This is exactly why I built this website- not only to answer these questions, but to help you make some important, educated decisions on how you can make child care jobs or career not only a profitable one, but also one that you will love doing for years and years (like me!). Throughout my many years of experience, I have cared for lots of children and dealt with all kinds and types of parents and situations. I know what works and what doesn't in child care jobs. And though there are trials and tribulations I have developed a very successful home business- one that rewards me financially, emotionally, and spiritually. To Teach You What I Have Learned from My Experiences. 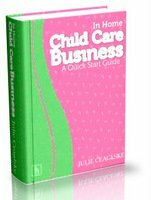 To show you and guide you through the process of becoming a Child Care Business Professional- not just a "babysitter"--a child care job. To help you "be the one" parents call first and if your daycare is full they beg you to put them on your "Waiting List". For you to be respected, successful, earning an income, as well as loved! Could this be your answer, your passion, your career, the stay at home mom solution, your child care job?